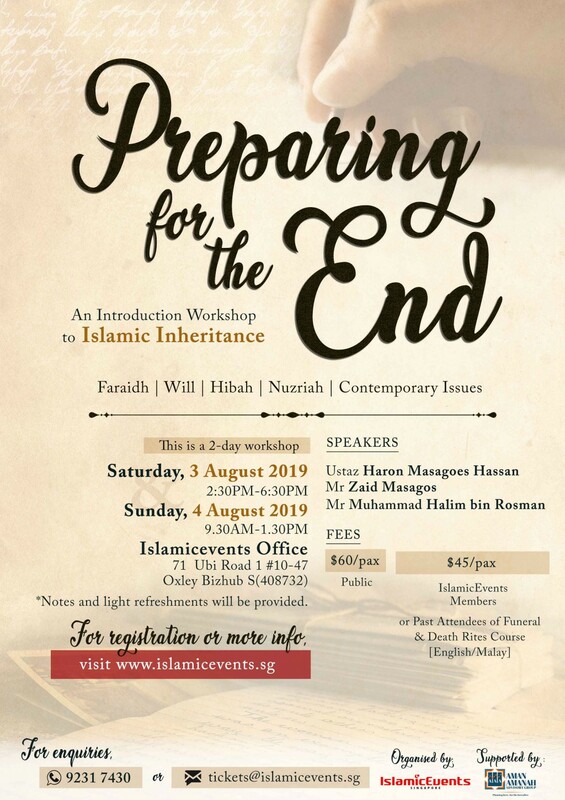 Fees: $60 per pax for public $45 per pax for Islamicevents.sg Members $45 per pax for past attendees of Funeral & Death Rites course. Narrated by Abu Hurairah r.a that the Messenger of Allah (saw) said: "O Abu Hurairah. Learn about the inheritance and teach it, for it is half of knowledge, but it will be forgotten. This is the first thing that will be taken away from my nation." According to prophecies made for during the End of Times is that these first few verses on inheritance will be lifted and removed from the hearts of our people. Even for a hafiz who memorised it will be forgotten and they will not be able to utter it. Our people will fight and argue about the wealth left behind by their loved ones and perhaps some of us may even attempt to do the worst to gain those fortune which may not be ours. This perhaps will destroy the foundations of families to come. Firstly we must understand that all the wealth in this universe belongs to Allah swt. Whatever we have now is a gift from Him which we are asked to be responsible for. Whatever that we earn needs to be gain lawfully ( Halal ) and its the same how we spend it. Similarly, we need to plan for it when we are no longer around so that it will not affect our family. What happens if you do not prepare for it? - Arguments about CPF and insurance payouts. - Why are my children getting so little of your wealth? How can that be? - We can list down more issues. Let's be frank, for each of the problems above, people have written essays about it and let's not even talk about the countless reports in the news. Some filmmakers have even been inspired by the stories which have been developed into films or dramas. Can you picture your family going through all the drama while you are in the ground? So let's get it straight. This is not about you anymore, it's about your family. Planning also requires knowledge and know how's? And do you know how? 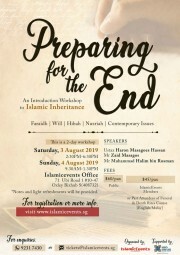 The following course is to educate you on the fundamentals and the foundations of Islamic Inheritance. This topic can go all the way to PHD level, however not all of us require that in-depth knowledge. Understanding the fundamentals like knowing the various terms in Wills etc is more than sufficient. Who needs this and when does one start to plan for this? 1) If you are married or divorce and especially with children. - Regardless of what age you get married at, this is the time when you need to start to plan for this. This is even more important if you are a divorcee and planning to marry again. 2) if you are single and yet have a substantial amount of money/assets. - Although things may change when you get married, this would be easier if you understand it earlier on and you can share this with your future spouse some day. Below are more details about this course. - Faraidh - Who gets first and who gets what? - Practical session: How to prepare a simple will for your family. $45 per pax for past attendees of Funeral & Death Rites course. * Notes and tea break will be provided. * Participants are required to bring their own writing materials. After this course, participants are encourage to go further to understand your own cases. Every individual cases are unique and inshallah there are solutions for it. You may approach the speakers for more help. 3) Participants will a Notes. 5) Organiser has the rights to make changes to the schedule or cancel the course. Participants will in advance for changes.